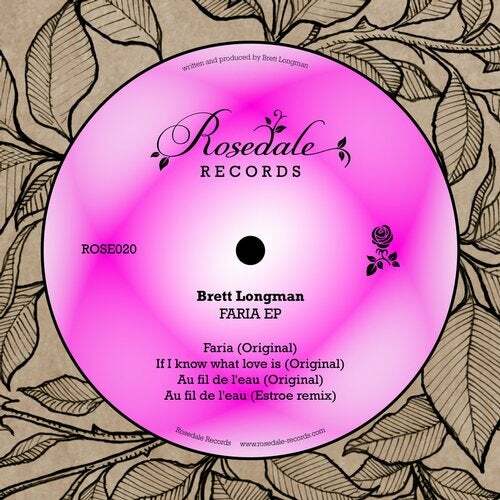 For Rosedale 20, Estroe welcomes Brett Longman (aka Alix Roy) with his own distinctive style. Brett is a singer/songwriter and producer. He describes his music as 'minimal grooves, sensually driven by electro sounds' and got in touch with Estroe after he noticed that she used one of his tracks in a mix. He really liked what Rosedale was doing musically and sent some tracks in. They met in Paris recently and are planning further releases. The seductive and hypnotic arpeggios in Brett's Faria conjures blurry daydream fantasies of someone smitten by the romance of new love. Hazy tonal 'imperfections' and occasional off-key slivers of metallic melody suggest the idea that while no one is perfect, love can fuse everything together into something beautiful and worth obsessing over. The underlying steady beat and deep pulsing bassline lend themself to the ideas of excitement and anticipation of finding 'the one'. Soft sine wave synth tones and vocoded vocal loops paint the aural canvas in If I Know what Love is. The atmosphere created is like the kind of itching anxiety of misread emotions and body language that one might get when feeling unsure about the direction of a new relationship. Brett's vocals bring a sense of loneliness to the mix like a deep introversion of one's mind. Ticking clock-like beats suggest a hesitancy of thought while the somatic bassline rumbles underneath and occasionally roars like the words of a thought that should be said but is suppressed instead. Like a moment in life where one finds their space and temporarily escapes from their racing mind, Au fil de l'eau invites the listener to indulge in self-reflection. Here, one can see the bigger picture. Brett's beautifully layered percussive synths and delicate, ever evolving melodic arpeggios represent the intricacies of being alive and how experience and emotion of the past come together and lead to here and now. Estroe's interpretation of Au fil de l'eau captures the self reflective essence of Brett's original track. Again, the elaborate use of gentle melody and arpeggios suggest the complexities of life while syncopated drums add an air of anticipation and excitement that something beautiful is about to happen. Deep bass notes hint at a sense of relief as they give way to soulful string pads near the end of the track like one has found the inner peace one was searching for.